One of the local quilt stores was giving me a birthday discount of 30% off and I could not pass it up. I have been waiting to by this expensive Kokka fabric called Echino in Green Rondo which is 62" wide and perfect colors for my sewing room to be! I will be making it into curtains, I can't wait. Then I have been doing alot of fabric swapping ( still waiting on some fabrics) and also some buying of fabrics which I promise is the last, but in all fairness who could pass up 30% off???? Ummmm not me. All of these colors are so me right now. 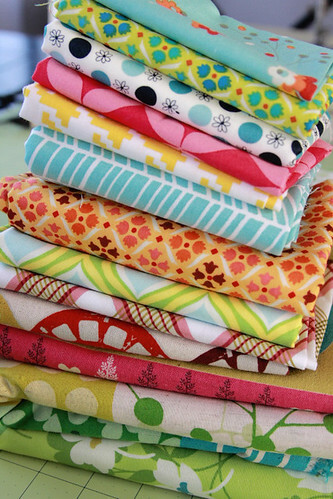 I just love them all, well except the Melody Miller's Ruby Star Rising fabrics those I will be doing a giveaway of on Monday so make sure to come back for that. I also was actually able to sew! Amazing I know since I have not sewn in almost 1 1/2 months because of packing and the move. The house is in chaos right now but I found my machine and put it on the messy table to make some bee blocks that were due this month. They are Spiderweb blocks that Yolanda from the Bee outside the box bee wanted us to make using this tutorial. I have made a bunch of spiderweb blocks now using the fabric backing like these blocks or the paper piecing method and I just have to say that I like the paper piecing method soooo much better. The fabric backing is harder for me since you measure the lines yourself and that takes more time and also mine NEVER end up the same which I hate I am not someone that makes things with straight lines mine always end up wonky. With the paper piecing the lines are already there for you and I don't have to worry. Luckily these blocks didn't turn out to bad. I love your spiderweb blocks! 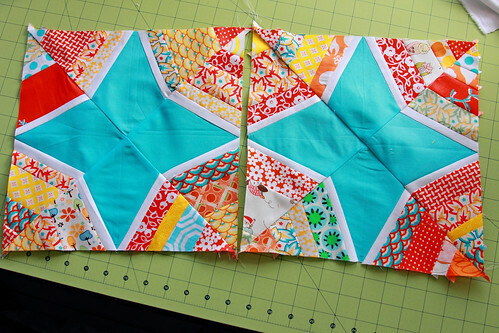 I use the paper piecing method too and find it so easy. NOT looking forward to moving next month. The unpacking is what gets me because I have to have everything unpacked before I can rest and SEW! Well the sewing part may just have to be done anyway dog-gone-it!!! Wow- I really love the last picture - City Weekend is one of my faves! Is there a particular place where you can print out paper templates to paper piece this quilt block? You have to buy them? Your not a fan of the RSR fabric? You might be the only one; I know flickr is buzzing about that fabric. Your spiderweb blocks are beautiful! Love them. 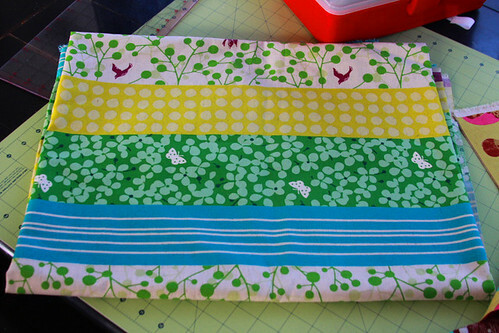 Oh, and I love the Echino fabric you chose for your curtains. Darci, that echino fabric is perfect! 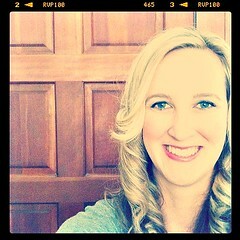 I can't wait to see your curtains1 (I still haven't put any curtains up in our house and we've lived here 8 months!) Enjoy your lovely fabric. I really like the colors you used on your spiderweb blocks...unique!! You're much braver than I am because I've wanted to try these blocks but am afraid mine will turn out awful or that they will be much too hard! You've given me inspiration!!! Thanks! I haven't conquered the spiderweb block yet, but I'd like to start marching on it. They look so fabulous!! !